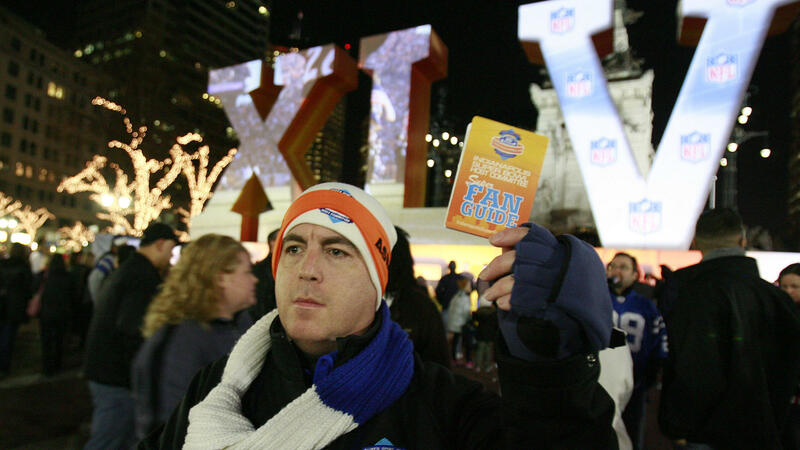 Super Bowl volunteer Ben Schreiber distributes fan guides for Super Bowl XLVI festivities in 2012. That familiar old preface we so often hear — usually from long-winded people — is: "To make a long story short." I've noticed lately that that expression has become more common, but, to make a long story short, it's been shortened to just "long story short." I'll even bet it's gotten initialed in the text universe to LSS. Well, long story short, last year I was astonished to discover that guileless fans were actually volunteering their services, for free, gratis, to the Super Bowl — which, of course, makes a gazillion million dollars for the NFL and its gracious owners. Now, incredibly, the NFL is looking for 10,000 volunteers to donate their time and effort to this season's Super Bowl in Arizona. Of course, I want you to keep in mind that the NFL is officially a nonprofit, even though commissioner Roger Goodell makes in excess of $40 million a year. (Lord knows what they'd pay him if he actually was doing a good job.) Of all the great, needy charities in the world, desperate for volunteers, who, in their right mind, would pick the Super Bowl? And the greed goes on and on. Worth keeping in mind, too, that the new Minneapolis stadium is costing about $500 million in taxpayer money with a sweetheart deal for the owners. Last year I said I was amazed that anybody would volunteer for the NFL. Now, it's simple to declare: If you people in Arizona volunteer for this season's Super Bowl, you're suckers. So we finish that report on how to be opinionated in a broadcast, and that brings us somehow to our commentator Frank Deford. FRANK DEFORD, BYLINE: That familiar old preface we so often hear, usually from long-winded people, is to make a long story short. I've noticed lately that that expression has become more common, but to make a long story short, it's been shortened to just long story short. I'll even bet it's gotten initialed in the text universe to LSS. Well, long story short, last year I was astonished to discover that guileless fans were actually volunteering their services for free, gratis, to the Super Bowl, which of course makes a gazillion-million dollars for the NFL and its gracious owners. Now, incredibly the NFL is looking for 10,000 volunteers to donate their time and effort to this year's Super Bowl in Arizona. Of course I want you to keep in mind that the NFL is officially a nonprofit, even though Commissioner Roger Goodell makes an excess of $40 million a year (laughter). Lord knows what they'd pay him if he was actually doing a good job. Of all the great, needy charities in the world desperate for volunteers, who in their right mind would pick the Super Bowl to help for free? The 2018 Super Bowl has been awarded to Minneapolis. Thanks to some superb investigative work by the Minneapolis Star Tribune, a 153-page list of stipulations that the league has demanded has been revealed. Here are just some of the NFL demands for what its trumpets as America's unofficial holiday; the league gets every cent of ticket revenue, 35,000 free parking spaces, all ATMs at the stadium must be those with NFL-approved credit cards, free presidential suites in top hotels. Hey, volunteers maybe you can pitch in and clean the bathrooms? Now, get this - if cellphone reception isn't quite good enough, for round-and-about then Minneapolis has to build the NFL sufficient new cellphone towers. I really like that one. And the greed goes on and on - worth keeping in mind, too, that the new Minneapolis stadium is costing about $500 million in taxpayer money with a sweetheart deal for the owners. Have these people no shame? Long story short, last year, I said I was amazed that anybody would volunteer for the NFL. Now it's simple to declare if you people in Arizona volunteer for this season's Super Bowl, you're suckers. LSS. INSKEEP: Long story short, you can hear the comments of Frank Deford each Wednesday on MORNING EDITION from NPR News. I'm Steve Inskeep. Transcript provided by NPR, Copyright NPR.